OSLO, Norway The European Union won the Nobel Peace Prize for fostering peace on a continent ravaged by war, yet the Norwegian prize jury warned Friday that the financial crisis challenging the bloc's unity could lead to a return to "extremism and nationalism." The award was hailed at the EU headquarters in Brussels and by pro-EU government leaders across Europe, but derided by "euroskeptics" who consider the EU an elitist superstate that strips citizens of their rights and erodes national identities. The EU grew out of the tremendous devastation of World War II, fueled by the conviction that ever-closer economic ties would make sure that century-old enemies never turned on each other again. It's now made up of 500 million people in 27 nations, with other nations lined up, waiting to join. But European unity is being threatened by the debt crisis that has stirred deep tensions between north and south, caused unemployment to soar and sent hundreds of thousands of its citizens into the streets to protest tax hikes and job cuts. The bloc's financial disarray is threatening the euro  the common currency used by 17 of its members  and even the structure of the union itself. The debt crisis is also fueling the rise of extremist movements such as Golden Dawn in Greece. The party, which opponents brand as neo-Nazi, has soared in popularity as Greece sinks deeper into a debt-fueled morass. "We do not have a position on how to solve these problems, but we send a very strong message that we should keep in mind why we got this Europe after World War II," Nobel committee chairman Thorbjoern Jagland told The Associated Press. "And that we should do everything we can to safeguard it, not let it disintegrate and let the extremism and nationalism grow again, because we know what catastrophes that all this leads to," he said. "If the euro starts falling apart, then I believe that the internal market will also start falling apart. And then obviously we get new nationalism in Europe. ... This is not a good scenario." German Chancellor Angela Merkel said the Nobel committee had made a "wonderful decision," and linked it to efforts to salvage the euro even though the judges didn't mention the common currency, specifically. "I often say the euro is more than only a currency. We shouldn't forget this in these weeks and months in which we work for the strengthening of the euro," Merkel told reporters at the Chancellery in Berlin. She said the euro "has always and primarily been about the original idea of Europe as a community of peace and values." The EU is an unique project that replaced war with peace, hate with solidarity. Overwhelming emotion for awarding of #Nobel prize to EU. "Nobel prize for the EU. At a time Brussels and all of Europe is collapsing in misery. What next? An Oscar for Van Rompuy?" said Dutch euro-skeptic lawmaker Geert Wilders, referring to Herman Van Rompuy, president of the European Council. Normally, the prize committee either honors lifetime achievement, like when longtime peace mediator Martti Ahtisaari won in 2008, or promotes a work in progress, such as the 1994 award to Yasser Arafat, Shimon Peres and Yitzhak Rabin, which was meant to boost Mideast peace efforts. This year's award does both. Jagland told AP it "looks backward as well as forward" by recognizing the EU's historical role in building peace, but it does so at a time when nationalist forces that once tore the continent apart are again on the rise. 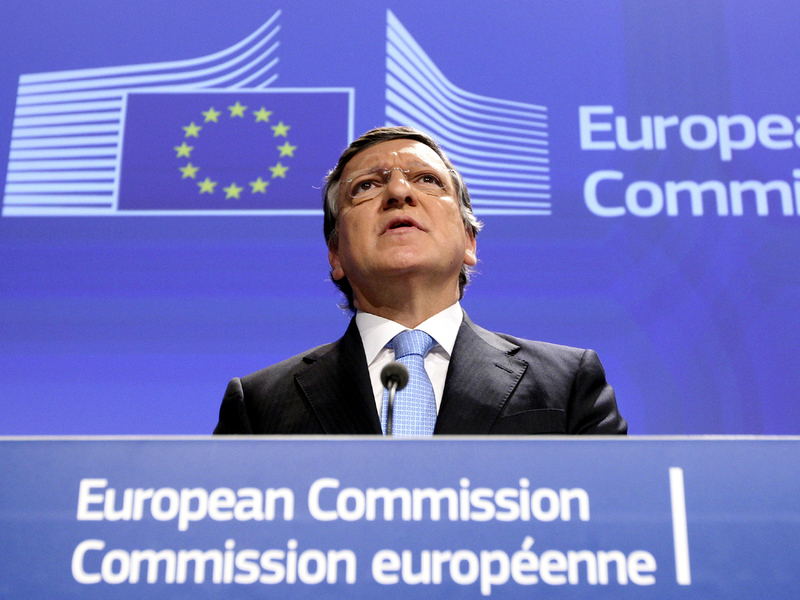 European Commission President Jose Manuel Barroso welcomed the award as a "great honor" for all Europeans. "It is justified recognition for a unique project that works for the benefit of its citizens and also for the benefit of the world," he said. The idea of a united Europe began to take a more defined shape when, on May 9, 1950, French Foreign Minister Robert Schuman proposed that France and the Federal Republic of Germany pool their coal and steel resources in a new organization that other European countries could join. Over time, the EU has grown from six countries to 27, absorbing countries in Eastern Europe as they emerged from decades under communist rule. "Today war between Germany and France is unthinkable. This shows how, through well-aimed efforts and by building up mutual confidence, historical enemies can become close partners," the committee said. The citation also noted the democratic reforms the EU demands of nations waiting to join. It referred to Greece, Spain and Portugal when they joined the EU in the 1980's after emerging from dictatorships and to the talks with Balkan nations seeking membership following the bloody wars there in the 1990s. Jagland said it was up to the EU to decide who should come to the prize ceremony in Oslo on Dec. 10, the anniversary of prize founder Alfred Nobel's death in 1896. While there have never been wars inside EU territory, the confederation has not been able to prevent European wars outside its borders. When the deadly Balkans wars erupted in the 1990s, the EU was unable by itself to stop them. It was only with the help of the United States and after over 100,000 lives were lost in Bosnia was peace eventually restored there, and several years later, to Kosovo. However, the EU's success in making war between Germany and France unthinkable is beyond dispute. Those two countries tend now to be the EU's dominant players, with the French president and the German chancellor often getting together to, in effect, hash out EU policy. Britain has always been a half-hearted member since joining in the 1970s, and is not part of the 17-nation eurozone that shares a common currency. Right now, Europe is stuck in a three-year financial crisis caused by too much government debt. To combat this, governments across the region have imposed harsh tax and spending measures to bring their deficits under control. However a fall in government spending has had a damping effect on Europe's economy  in the second quarter of this year, the EU's gross domestic product shrank 0.2 percent compared to the previous quarter. A wide variety of indicators are pointing to a further slump in the third quarter. The austerity measures have also hit jobs - the EU's unemployment rate is currently 10.5 percent. But some countries such as Spain and Greece have rates as high as 25 percent. In Spain, every other person under 25 is unemployed. Europe's stumbling economy is making it harder for other economies around the world to recover and policymakers from all round the world are urging more decisive action from the region's governments to deal with the crippling debt crisis to restore confidence to the global economy. The region is the U.S.'s largest export customer and any fall-off in demand will hurt U.S. businesses  as well as President Obama's election prospects. The EU has been seen as possible candidate for the Nobel for many years, and the members of the committee had previously praised the community's significance as a promoter of peace and democracy in Europe. Jagland is also the secretary-general of the Council of Europe, a human rights group. Ironically, skepticism against the EU runs high in oil-rich Norway, which is not a member and where popular opinion is firmly against membership. Norwegian voters rejected joining the EU twice, in 1972 and 1994.